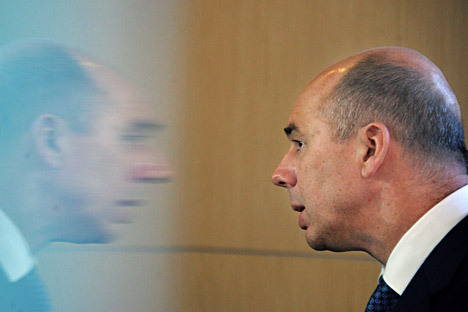 Finance Minister Anton Siluanov tells Kommersant about why Russia needs a financial mega-regulator and how the auhorities plan to privatize state-owned companies in 2013. Why does Russia need a financial mega-regulator? Kommersant: What is mega-regulation all about? Why was the Ministry of Finance so keen to redistribute its powers in favor of the Central Bank? Anton Siluanov: When the question arose regarding the effectiveness of the accumulative part of the pension fund, one of the just complaints about the existing system was the lack of supervision and financial regulation. In that regard, we already have a harmonized system of bank supervision. A regulatory framework is in place, plus the qualified personnel of the Bank of Russia – something that the financial market does not have. From 2005 to the present day, the volume of deposits has increased by 11 trillion rubles to a total of 13 trillion rubles; while, in the same period, deposits by members of the public in the non-banking sector have risen by just 1.3 trillion rubles ($43 billion) to 1.56 trillion rubles ($51.6 billion). The difference in terms of public involvement is almost a factor of ten, partly because financial regulation and supervision have not been correctly tailored. In the circumstances, our opinion is that it would be wiser not to carry out a complete reform of the activity of the government regulator, but to hand control over to the Bank of Russia. The Central Bank is, after all, an established financial institution. What is more, international practice has shown consolidated supervision over the entire financial market to be far more effective when carried out by a single entity. That is why the government drafted a set of proposals to create a single regulator, and we believe that this will help citizens select the right investment tools for their savings. Kommersant: Is the financial market ready to innovate? A.S.: The Russian financial market has not developed as we would have liked. Russia's share of the global stock market has steadily declined and is now only 1.5 percent – less than the country’s 2.7 percent share of world GDP. Without financial market development, the task set by the president to increase the investment to GDP ratio from 20 percent to 25 percent by 2015 and to 27 percent by 2018 is unachievable. But a lot has been done already. For example, we are ready to start up the Central Depository, and GKO-OFZ government bonds will be able to be cleared via Euroclear from 2013 and shares from July 2014. Stock, commodity and currency market services are now VAT exempt. Investment income is due to be released from personal income tax. The basics of stock exchange mutual investment funds have been determined. To ensure a steady flow of quality investment assets, the option of carrying out privatization only in the Russian markets is being considered. At present, Russian stock accounts for 30 percent of trading on the London Stock Exchange. But there is still an awful lot to be done. An important task is to complete the capitalization of the central counterparty: its effective operation would resolve many issues, including those related to the liquidity of the financial markets and the development of derivatives trading. It is important to launch the T+2 model for trade settlements, which would make stock exchange operations much more convenient. We need to finish work on setting up an institution of individual investment accounts, for which taxation will be unified with other individual investments. The key issue is to solve the problems related to the so-called negative revaluation of pension savings, which turns essentially long pension plans into annual interest payments, but in a way that preserves the integrity of the retirement savings until the pension is allocated. The issue of pension inheritance is also being developed. Attention needs to be paid to the status of non-government pension funds (now NCOs), which limits their efficient operation. It is important to introduce investment products differentiated by the degree of risk involved for future retirees, making such products dependent on age and, perhaps, willingness to take a risk. There is much to do in the field of insurance. Every year sees up to a hundred insurance companies file for bankruptcy, which undermines public confidence – especially in regards to life insurance. Industry experts say that, provided public confidence increases, savings in the sector could reach 1 trillion rubles ($33 billion) by 2020, up from today's level of 22 billion rubles ($727 million). Kommersant: Where is the Russian Financial Agency (Rosfinagentstvo) project at right now? A.S.: In his message to the Federal Assembly, the president instructed that all conditions be put in place to allow Rosfinagentstvo to start operations next year. In September, the government submitted to parliament a set of amendments to the Budget Code to create the legal basis for Rosfinagentstvo. The consultation process in the State Duma is complex. We have submitted a lot of additional material and expect deputies to give a green light to the organization early next year. Kommersant: Will control of sovereign funds also be transferred to Rosfinagentstvo in 2013? A.S.: Yes. That is the only way to fulfill the president's decision to invest up to 100 billion rubles ($3.3 million) in the domestic financial market next year. How and why does the government plan to privatize state-owned companies? Kommersant: In 2011, President Dmitry Medvedev set the goal of achieving fiscal decentralization to the value of 1 trillion rubles ($33 billion). But, under the Ministry of Finance's plan through 2014, only about 67 billion rubles ($2.2 billion) will be redistributed to the regions. Will the budget commitments of the regions and municipalities increase in proportion to the Ministry of Finance's plan, or do you see hidden opportunities for local budgets to increase outlays? Anton Siluanov: The redistribution of powers among public authorities is a long process and will not be limited to one calendar year. Since we have just one budget pie, it's not possible to transfer such a sum from the federal budget to the regions all in one go. That means that inter-budget transfers to the regions need to be almost doubled and federal spending reduced accordingly. But there are no funds available in the federal budget — we also lack sufficient sources of income to meet our obligations. Therefore, we believe that regional budgets should be topped up through both increasing revenue and reducing expenditure. Otherwise, it's no good strengthening one budget by bleeding another one dry. But even in the current penny-pinching circumstances, resources have been found to aid the regions. Total subsidies will be adjusted by 21.8 billion rubles ($721 million), to bring regional budgets into line, and 100 billion rubles ($3.3 billion) will be allocated to implement May's presidential decrees. Next year will also see the phasing out of reduced rates of property tax for natural monopolies, which will create around 35 billion rubles ($1.1 billion) of extra revenue for regional budgets. Therefore, revenue growth at the regional level will occur in several ways. Most important of all is that regional budget growth will occur through increasing the local revenue base: according to the Ministry of Finance, in 2013, tax and non-tax revenue in the regions will increase by more than 1 trillion rubles against 2012 to around 8 trillion rubles. Kommersant: Igor Shuvalov announced plans for a major program of regional privatization, and it was suggested that it should be funded by the budgets of constituent entities. But the plans of even the most forward-looking regions (such as Khanty-Mansiysk) are regularly reviewed and reduced. It could be said that the privatization of regional budget financing has failed. The Ministry of Economy is talking about an inevitable rise in regional budget deficits (up to 1.8 trillion rubles by 2020) and the need to cover it with new taxes, such as a retail tax. What is the Ministry of Finance's attitude to that? A.S.: The largest spending increase in the consolidated budgets of Russia's constituent entities, relative to 2012, is expected in 2013, due to May's presidential decrees. They include higher wages for teachers and pre-school educators, benefits for families that have a third child, more places in pre-school educational institutions, funding for the resettlement of people from emergency housing, and the construction of facilities on land plots for families with many children. From 2014, expenditure growth is expected to slow, since the most costly item — raising teachers' wages to the average regional level — will occur in 2013. All additional costs fall within each individual region’s projected sources of income. Therefore, we expect lower regional deficits than those forecast by our colleagues at the Ministry of Economy.